Although little is known of the organs at St. Andrew’s prior to a 7-rank Kimball that was here from the 1950’s through 2001 (which stood on the floor in the baptistery), a November, 2001 fire that started in the undercroft caused extensive heat damage to that organ, rendering it unusable. Choirmaster Krueger immediately convened a committee to investigate options for a new organ, to be installed once the congregation returned following extensive repairs to and restoration of the church building. The result of this committee’s year-long work was the selection of the firm of John Paul Buzard, in Champagne, Illinois, to construct a 20-some rank slider-action organ. In order to maximize floor-space in the back of the church, a platform was constructed in the baptistery to accommodate this organ. Insurance money, together with a capital campaign in 2003, provided $350,000 for this project. The present Buzard organ (Op. 26) was installed in 2003, with provision for future additions. Several of these (mostly reeds) were added in 2008, but an antiphonal division and several other gaps remained. As the church building itself was expanded in 2008-9, and resulting financial obligations forced a halt to contemplation of further additions, a decision was made to explore other avenues to increase the dynamic range and color possibilities of the instrument, thereby making it more flexible and capable of effectively meeting the demands of a large corpus of organ literature and choral accompaniment. A relatively inexpensive temporary solution was discovered in Hauptwerk, a computer software program that realistically reproduces the sound of a pipe organ by utilizing recordings taken from a real instrument. From a large library of digitally sampled instruments we chose a pipe organ in Chicago built by Ernest M. Skinner in 1928 as being most compatible with the tonal qualities of our Buzard organ. The seamless integration of the two instruments is quite remarkable and has greatly expanded the versatility and registration possibilities for service playing and recitals. Previously unheard voices, such as Chimes, Harp, French Horn, Tuba, and Orchestral Oboe are now readily available, and most parishioners are totally unaware of which sounds are being produced by pipes or the computer. 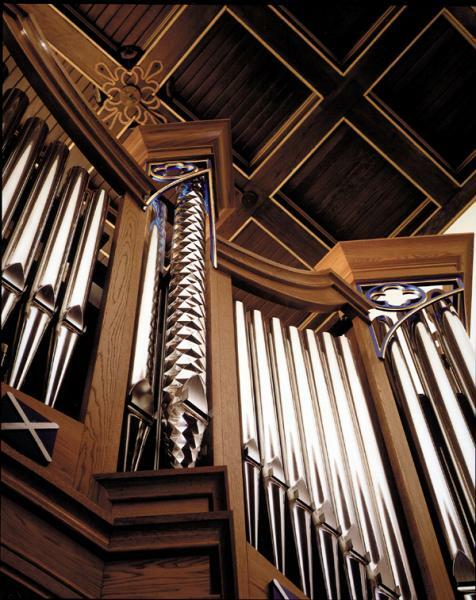 Although we are still hopeful that we will be able to complete the original instrument as planned, we also rejoice in being able to support our excellent music program with our current combination of a traditional pipe organ enhanced with computer generated tonal additions. For a specification of the organ as originally conceived in 2001, please read more about the Buzard Organ here.